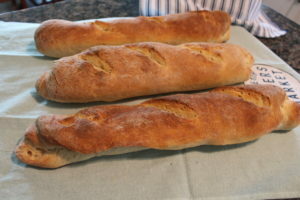 Woot, Woot – I Made French Baguettes..Thanks, King Arthur Flour! My first French Baguettes — I look at them like my babies..I don’t see any imperfections just the most beautiful things in the world. 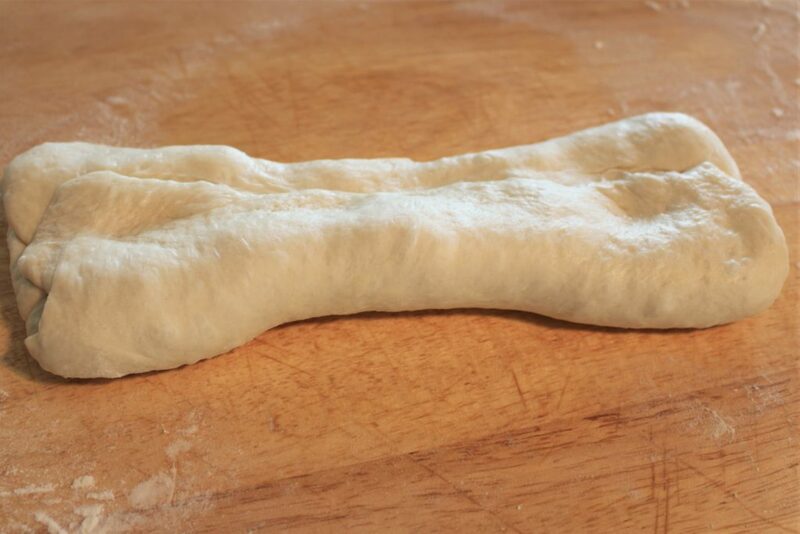 I have always wanted to make French Baguettes. 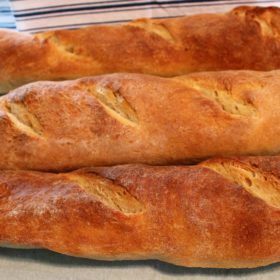 For me nothing is as delicious as a slice of a baguette, crusty on the outside, soft and flavorful on the inside, slathered with butter or a sumptuous French cheese. Baking bread was not something we did in our household. With nine brothers and two sisters, you couldn’t make enough bread in a day to feed or keep them happy! So taking on a baguette was kind of like skipping walking in a 5K to run in a 25K marathon without any training. What could go wrong? My desire to make them only got stronger after a marvelous trip to Paris this spring with my sister. They were served at every meal and oh my, so delightful– sigh…I miss them. 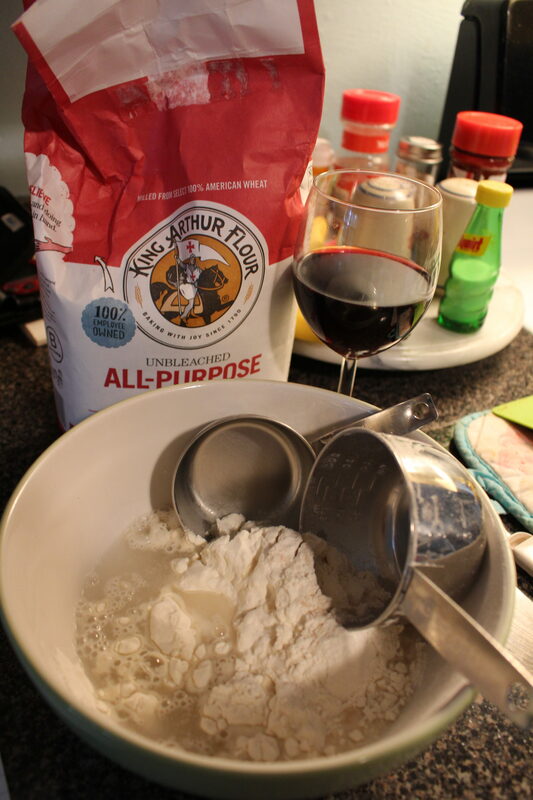 So when I saw the King Arthur Flour Bakealong post on Facebook – I was all in. I just had to get my nerve up so I reminded myself of Julia Child’s quote. “The only real stumbling block is fear of failure. In cooking you’ve got to have a what-the-hell attitude.” So what-the-hell let’s do it! Here is my how my bakealong challenge #11 from King Arthur Flour went, however, here is the link to the King Arthur Flour Bakealong for the baguettes — you should use their instructions — they are the pros — my pictures are just to prove to you that I did it and you can too! 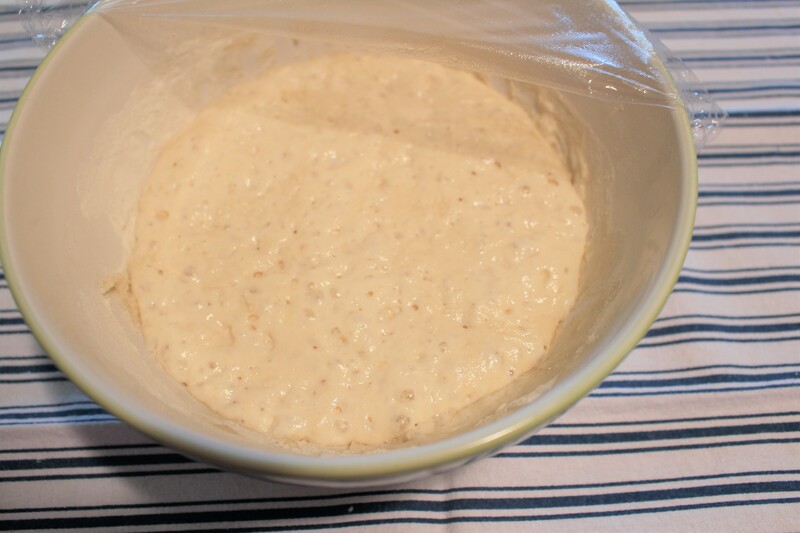 Gather your ingredients and make the “starter” 14 hours in advance. So I made mine the night before — and yes that is a glass of red wine. Cheers Julia! 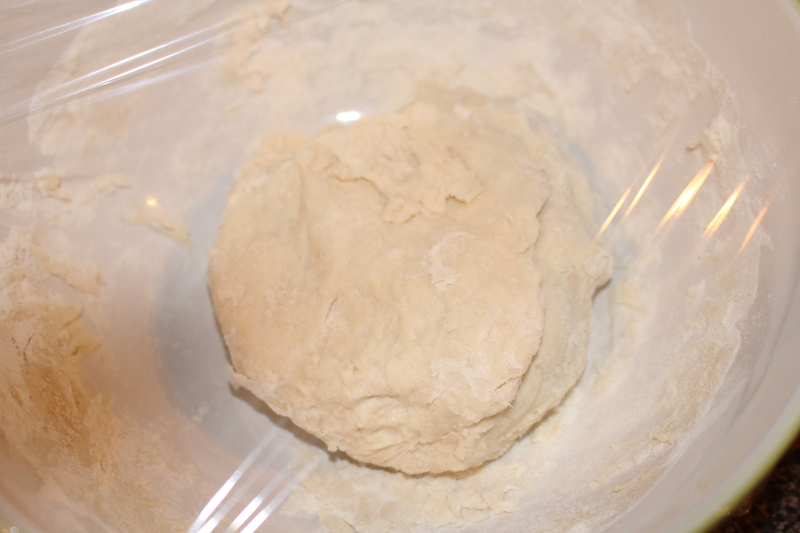 Figuring out if my started looked correct threw me a minute …mine seemed a little thicker than the one in KAF photo. I’m never sure if you should dip your measuring cup in the flour or spoon the flour into the cup. I dipped, but I think you should spoon it into the cup so it isn’t as packed. Hot damn, Sam…..it worked! 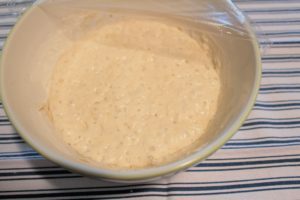 The yeast did it’s work and I have a starter! 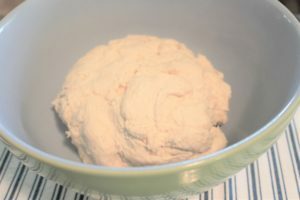 I used my KitchenAid mixer — next time I will work the dough by hand. I think I again had too much flour because I scooped my flour which packed it into the cup. I had to add more water — I’m sure it was my error. 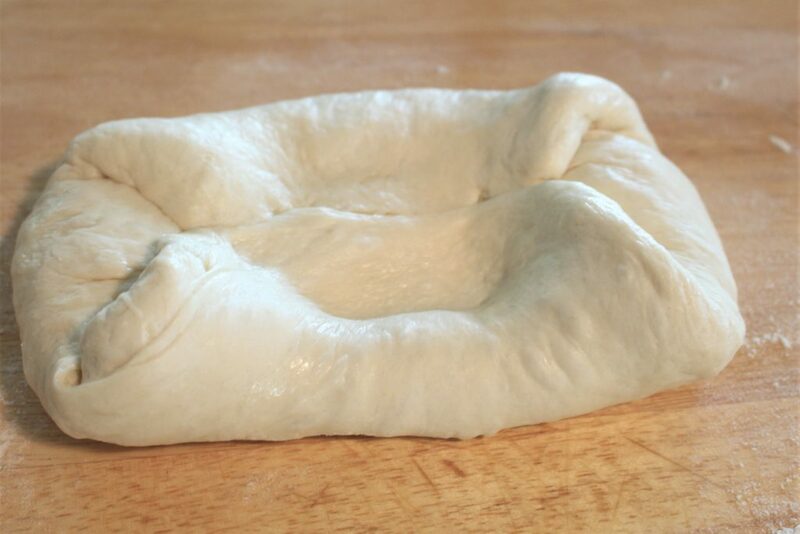 I probably could have kneaded this to make it smoother before letting it raise. 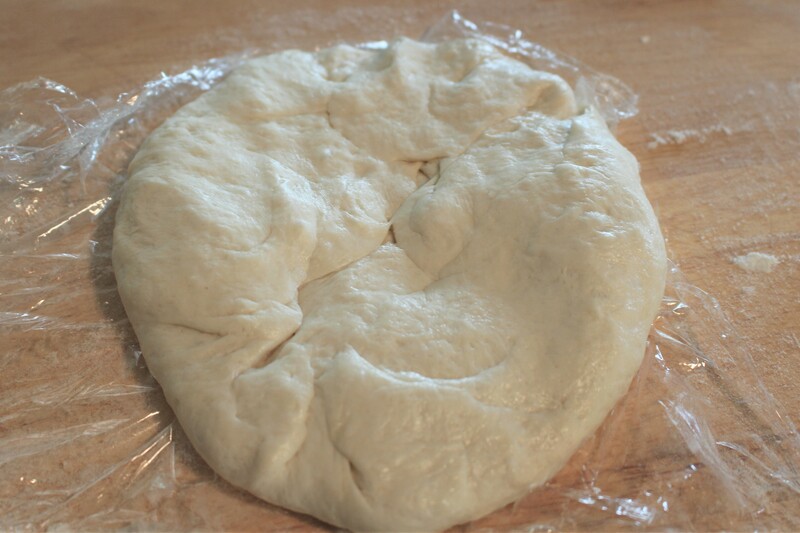 Yeah, team it raised as expected — after 90 minutes you deflate and let it raise again for another 45 minutes. 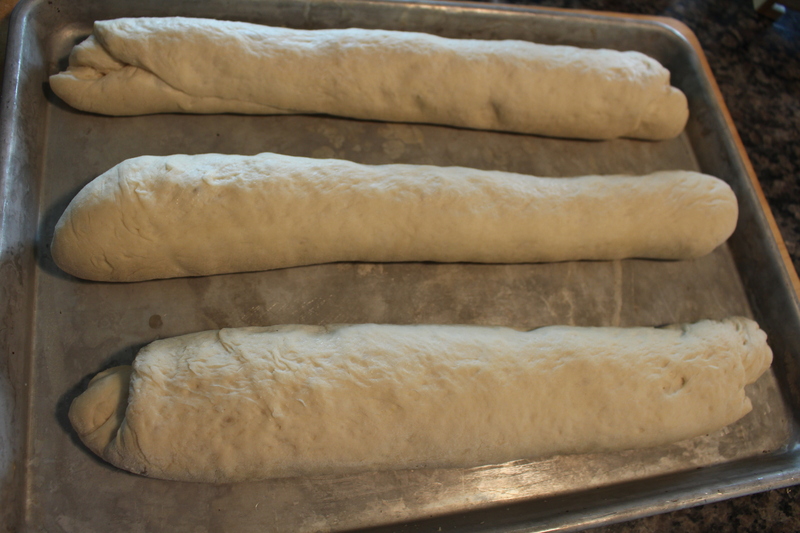 (I will admit I messed this up — I had run and errand and came back late)…but it forgave me and I still got baguettes! Divide dough evenly into 3 portions. 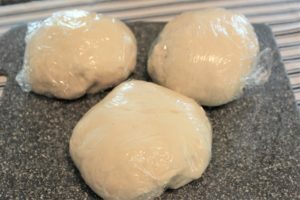 Fold inward to create 3 equal balls of dough. OK — As you can see I’m wasn’t so good at the equal portion thing…don’t judge. Let rest for 15 minutes and up to 1 hour. Working with one piece at a time, flatten the dough slightly then fold it nearly (but not quite) in half, sealing the edges with the heel of your hand. 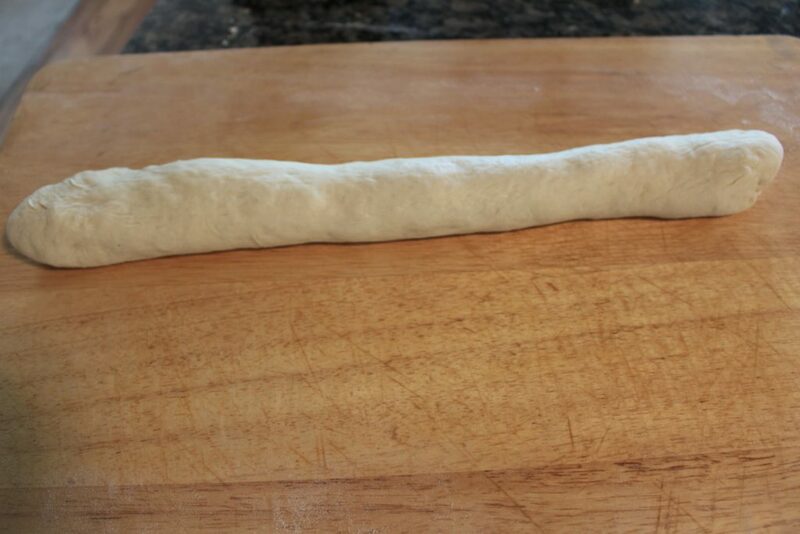 Start to roll out your dough to create a 15 inch log for your French Baguettes. You will want to get them try and get them to 16″ because the will shrink slightly. And yes, mine looks a little like a doggie bone treat. With seam side down move to where you plan to let the log raise again. Mine is actually pretty good, I might brag a bit. 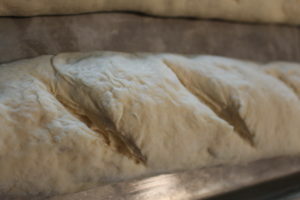 Place the logs seam-side down onto a lightly greased or parchment-lined baking sheet; or into the folds of a heavily floured cotton dish towel (or couche). This was a little trickier than expected, but then again I am a bit of a klutz…but I got it done! 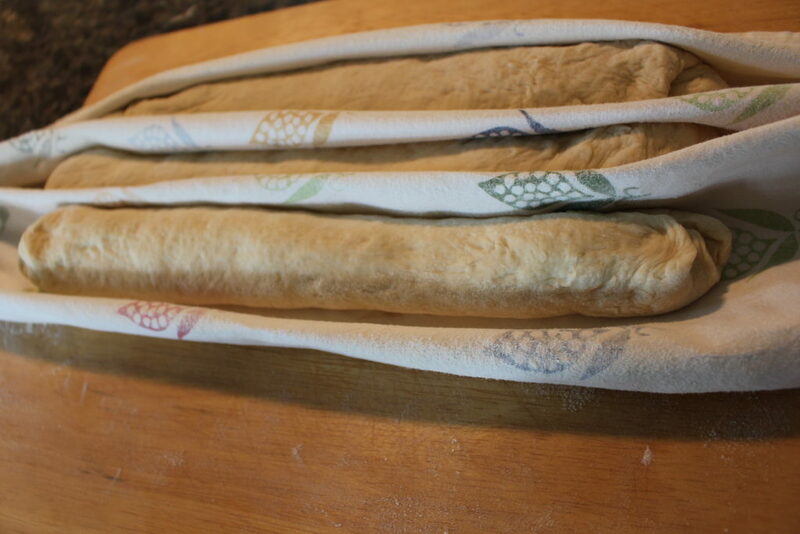 Well I guess if the balls you started with are not the same size, the baguettes will all be different…LOL But I managed to get them on the sheet pan seam side down without rolling any of them on the floor. That was a win-win! Creating cuts in your baguette seems like it would be an easy step — Hint, hint, hint…use a very sharp knife so you don’t hack them up it like me. Now I know…. This old cast iron skillet is the secret to crusty baguettes. This is also the “dangerous” part! 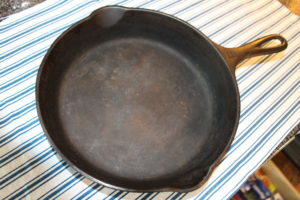 Carefully pour the boiling water into the cast iron pan, and quickly shut the oven door. The billowing steam created by the boiling water will help the baguettes rise, and give them a lovely, shiny crust. Here are my lovely baguettes…they are far from perfect, but I loved them and they tasted great! Even though I made lots of mistakes along the way, I learned that I can do this and “practice”, “practice”, “practice” will be my mantra! 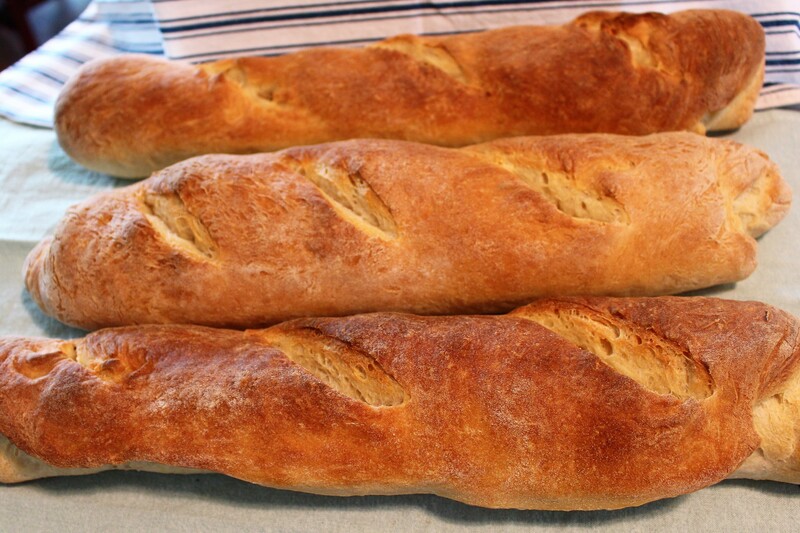 This is the King Arthur Bakealong recipe for Classic Baguettes. If I can make the crusty, wonders of the bread world -- so can you! See the King Arthur Flour Bakealong at http://blog.kingarthurflour.com/2017/06/01/classic-baguettes-bakealong/ for the best instructions on how to make these wonderful baguettes. Congratulations, success. I love baguettes. 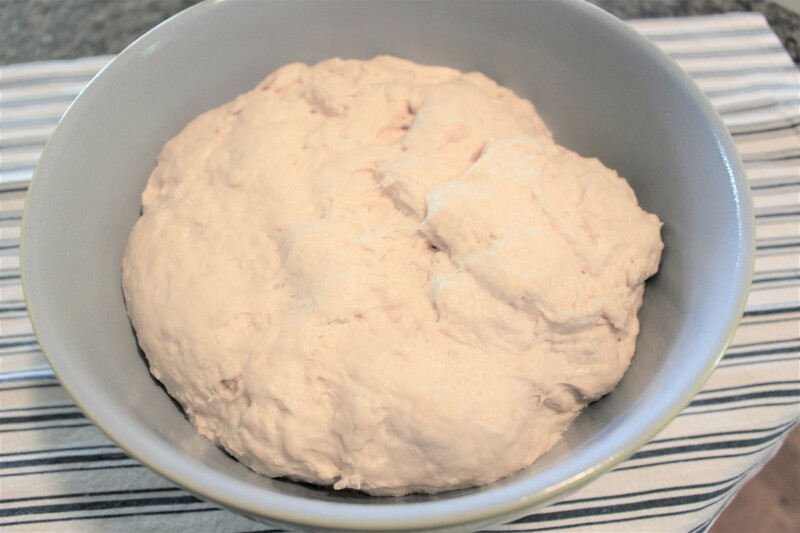 Doubt I could make them though, yeast and I have a long time war going on and I’ve only won 2 battles through the years of trying. I can relate, but I wanted to give it another try — these directions were really helpful since I didn’t grow up with a bread baking family. Thanks Rachel — I’m excited someone other than my family reads my posts! Hi to you and Larry — Sue and I are doing great and planning our next trip! Mary, these are beautiful. I’ll let you know when I’m coming your way. Keep up the good work! Thx! You are always welcome to stop in on you many travels.